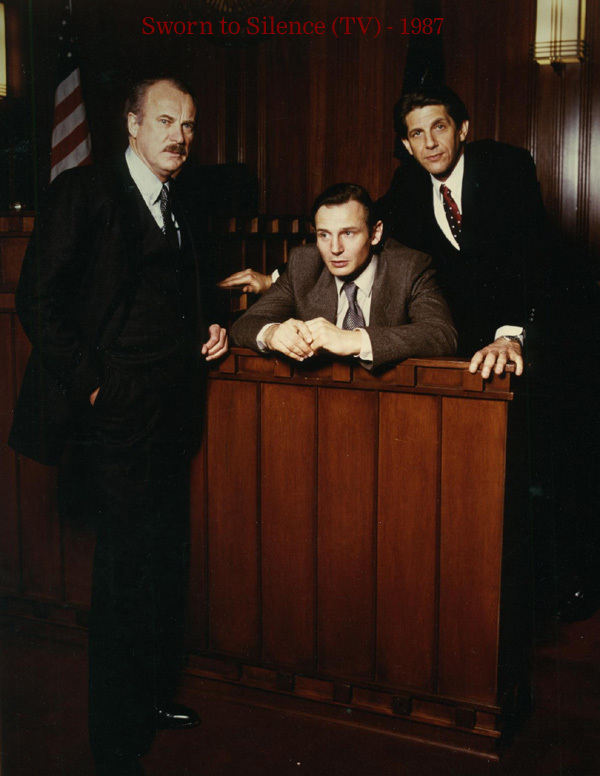 Peter will be appearing in several episodes of "Trial by Jury", the fourth installment of the NBC franchise, "Law and Order". The series is slated to bow on NBC during the midseason. 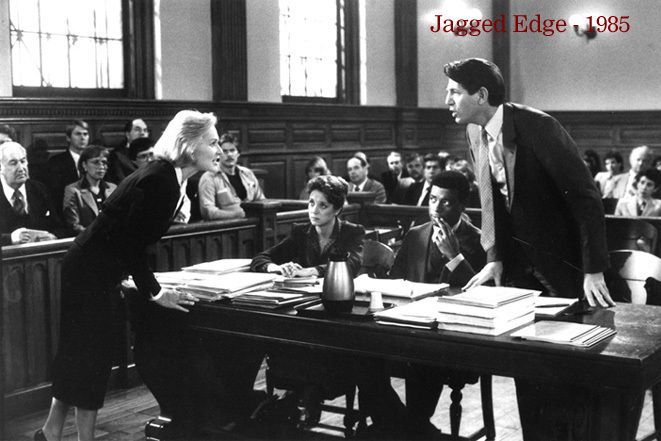 The cast includes Candice Bergen as Judge Amanda Anderlee, Amy Carlson as Deputy ADA Kelly Gafney, Jerry Orbach as Det. 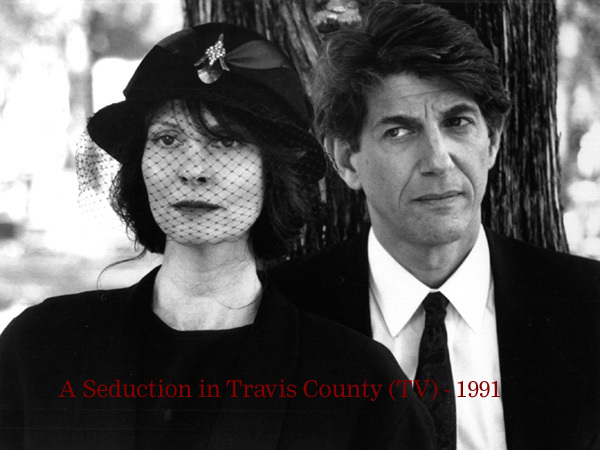 Leonard "Lennie" Briscoe, and Bebe Neuwirth as DA Tracy Kibre. Peter plays a scurrilous lawyer named Mike LaSalle, who defends a cold-blooded killer, played by Naughty by Nature's Treach. Peter adds that he loved this character and had great fun filming in NY this fall. 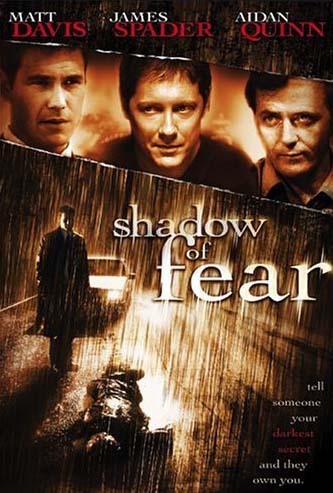 DVD release dates: Shadow of Fear, directed by Rich Cowan (The Basket), on January 11, 2005 and the 6-hour first season of USA's The 4400 series on December 21, 2004. Filmmakers Bo Boudart and Dale Djarassi will be honored on December 10th by the IDA (International Documentary Association) for their one-hour documentary, "Oil on Ice", which focuses on the controversy over drilling for oil in the Arctic National Wildlife Refuge. Narrated by Coyote, the film is described as a visually stunning journey through a land that is teeming with wildlife, enriched by centuries of Native American culture, and at risk of being destroyed by the invasive trucks, bulldozers, smoke stacks, pipelines and tankers of the oil industry. Interviews with native Inupiat Eskimos and Gwich'in Indians, as well as esteemed arctic biologists and environmental experts, show how the fate of the refuge is inextricably linked to decisions our nation makes about energy policy, transportation, and other seemingly unrelated matters. 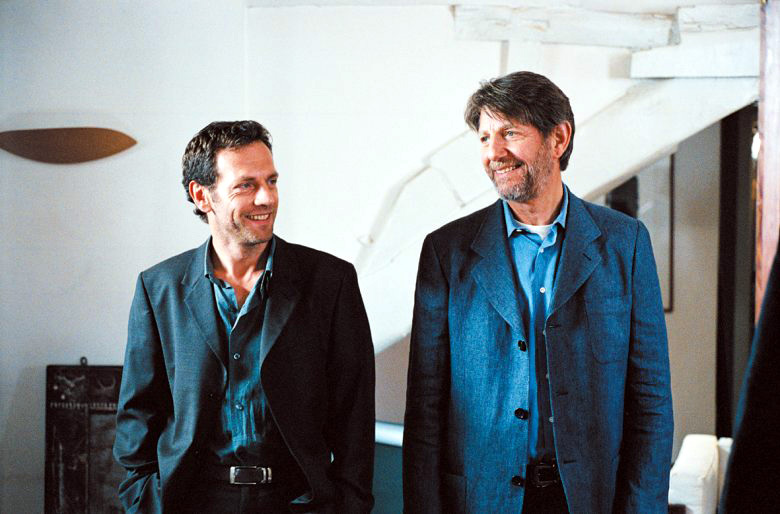 Boudart and Djarassi will be presented with the IDA's Pare Lorentz Award. The film debuted last May at the Telluride Mountain Film Festival. To more information or to order the DVD, visit Oilonice.org. Traveling Light Media has announced that The Kevin Costner A&E Biography, a show produced & directed by Adam Friedman, written by Bill Evashwick and narrated by Coyote, has won a prestigious CINE Golden Eagle Award. The Cine Golden Eagle awards, distinguishing excellence in professional and amateur works, are recognized internationally as symbols of the highest production standards in filmmaking and videography. There are new additions to Coyote's Photo Album - black & white photos (some dating back to the '60s), a montage from The Charlie Rose Show (7/19/99) and photos from Peter's performance in "Olive Pits" in December 1999. If anyone is interested in purchasing the videotape of the Charlie Rose Show, in which Peter discusses his book, "Sleeping Where I Fall", follow this link. 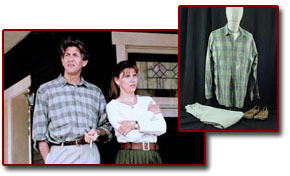 If you've ever wanted to own some of Coyote's film wardrobe, here's your chance! 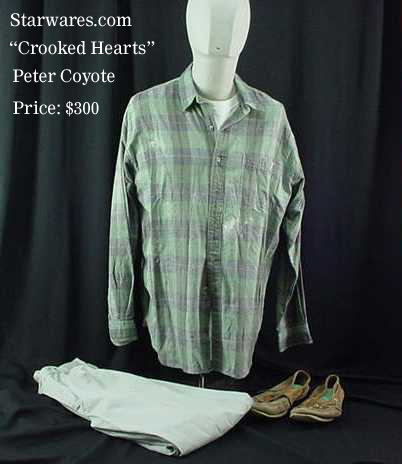 Check out his shirt, pants and shoes worn in the film Crooked Hearts selling for $300 at Starwares.com. 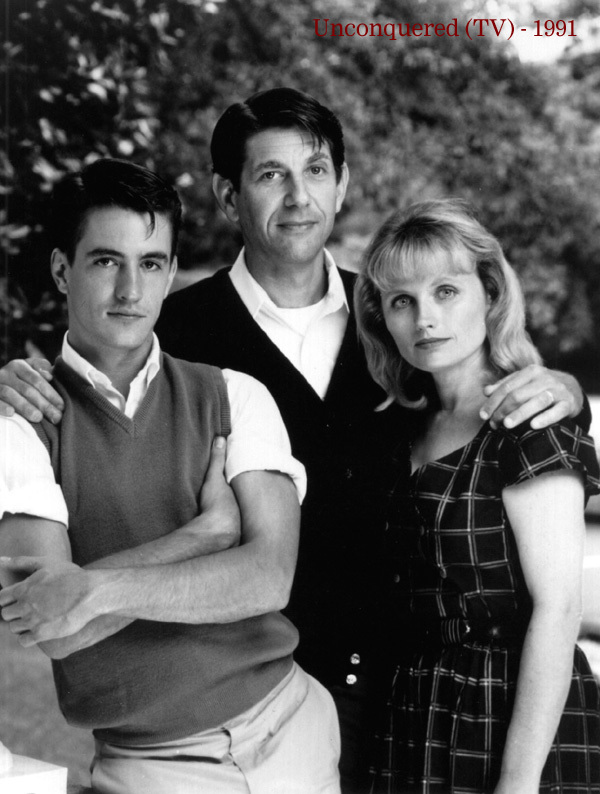 The photo below shows Peter with co-star Cindy Pickett. 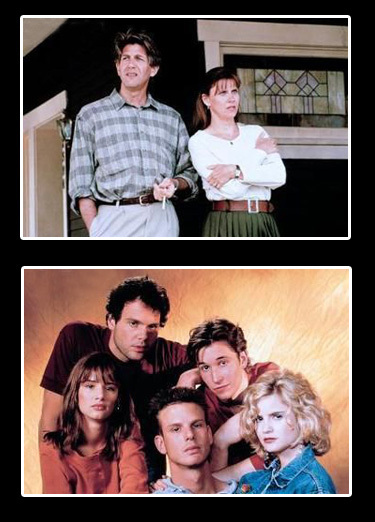 This 1991 movie about a dysfunctional family had some now popular names - Peter Berg, Noah Wyle, Jennifer Jason Leigh, Juliette Lewis and Vincent D'Onofrio. More trivia - name another Coyote/Pickett film. Click here for answer. From the Philadelphia Inquirer, 11/17/04: "Several small tarts were on the dessert plate that had 80th year written in chocolate. It was a sweet finale to an early VIP dinner Saturday at the DoubleTree Hotel for the start of a yearlong celebration of the Gershman Y's eight decades. The Broad Street Y is the Jewish Community Center of Greater Philadelphia's arts and cultural branch... About 30 guests were at the dinner prior to the first showing of Le Grand Role at the 24th annual Jewish Film Festival. 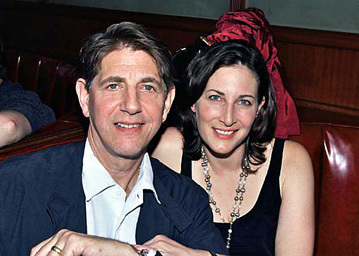 Dining as special guests were Peter Coyote, the film's star, and Jean-David Levitte, French ambassador to the United States... About 500 people saw the Coyote film, which was followed by a dessert reception called Around the World in 80 Years and featured a 17-foot-high hot-air balloon as centerpiece." The San Francisco Chronicle asked Bay Area artists from several disciplines how President Bush's re-election, as well as the nation's attitude on social issues would influence their art. In the 11/8/04 edition, Peter was quoted with these remarks: "The thing is that because of the nature of my work, as a hired actor, I don't get an opportunity to communicate my beliefs. Still, I try to make sure that my writings get published so I can be heard. I won't accept a role just because it's political; no one gets convinced by propaganda and bad art. Most of the scripts are like this that I've seen. I make a schism in my life, and acting is what I do for money. I don't think people will go back in their holes. It's astounding that centrist Democrats are so deficient on representing the needs of people. The Democrats talk programs and the Republicans talk about what they believe in. They are woefully deficient in specifics on these programs, but people don't seem to care as long as their core values are reflected." 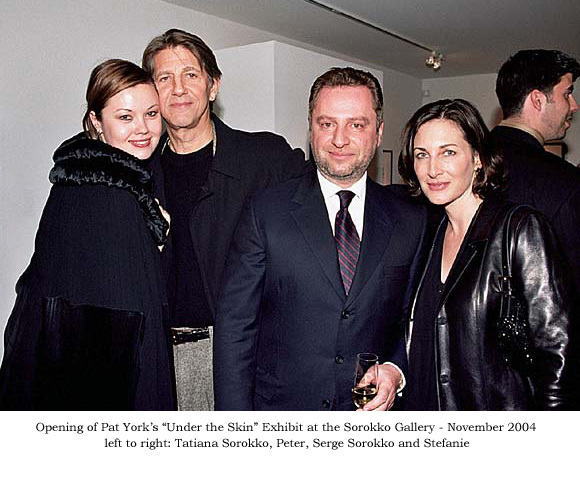 Peter recently attended the opening of a new exhibit at the Serge Sorokko Gallery in Union Square. Photographer Pat York (wife of Michael York), displayed her latest project, "Under the Skin". Peter is shown here with Tatiana Sorokko. The San Francisco Chronicle asked Bay Area artists from several disciplines how President Bush's re-election, as well as the nation's attitude on social issues would influence their art. In the 11/8/04 edition, Peter was quoted with these remarks: "The thing is that because of the nature of my work, as a hired actor, I don't get an opportunity to communicate my beliefs. Still, I try to make sure that my writings get published so I can be heard. I won't accept a role just because it's political; no one gets convinced by propaganda and bad art. Most of the scripts are like this that I've seen. I make a schism in my life, and acting is what I do for money. I don't think people will go back in their holes. It's astounding that centrist Democrats are so deficient on representing the needs of people. The Democrats talk programs and the Republicans talk about what they believe in. They are woefully deficient in specifics on these programs, but people don't seem to care as long as their core values are reflected." Buddy Pictures Inc. has asked Peter to narrate their new one-hour documentary, "About Face: The Story of the Jewish Refugee Soldiers of WW II." Director Steve Karras says, "We are so honored that Mr. Coyote has agreed to narrate our film. We are big admirers of his work. Because of the social significance of this project, we were eager to get Mr. Coyote, a long-time political activist, involved with our project. The film is near completion and we hope to begin applying to film festivals." The film documents the as-yet-untold World War II story of young Jewish men who escaped certain danger at the hands of the Nazis and returned to fight them in Europe and North Africa. Told through the eyes of these men, the documentary chronicles the journey from Nazi victim to refugee and, finally, to Allied soldier. Interview subjects include Henry Kissinger. A new documentary narrated by Peter will premiere on November 17th on UCSD-TV and on November 23rd on UCTV. It's called "In the Shadow of White Mountain." Nearly three years in the making, this film will take viewers to the peak of the University of California's White Mountain Research Station to see just what it means to study life on the edge. Producer/Director Rich Wargo says Coyote's narration is "a very mellow and expertly interpreted reading performance. He put his heart into it, something rare and precious anytime, but especially in the oft-jaded world of production. He's definitely one-of-a-kind. Read the full press release - "Coyote 'howls' as 'In the Shadow of White Mountain' enters final phase of production." "THE 4400" will return next summer! 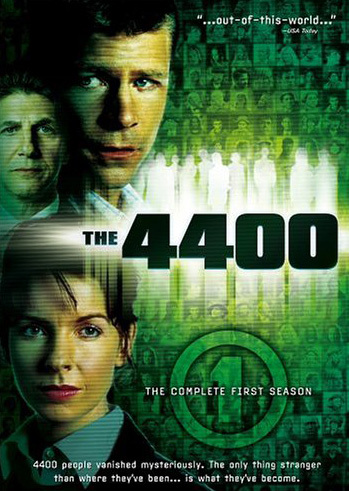 USA Network has ordered a second season of "The 4400," the record holder for the highest-rated series debut in basic cable history. The series became a surprise hit for USA in July, premiering to 7.4 million total viewers, eclipsing previous holder, "The Dead Zone" by 1 million. The six-hour series chronicled UFO abductees who returned to Earth with mysterious powers. 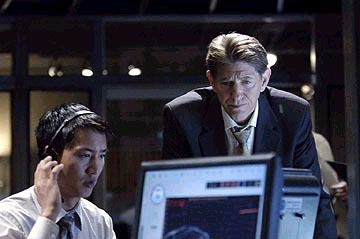 Peter had the role of Dennis Ryland, supervisor of the federal agency created to investigate and oversee the 4400. 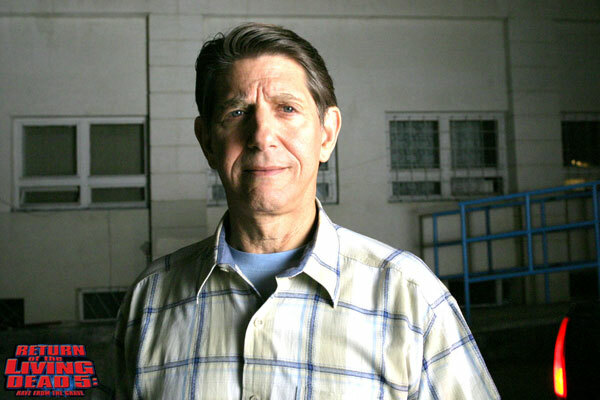 Eclipse Magazine praised the series with "Peter Coyote lends weight to 'The 4400'. He has a presence that can be as gentle as a fawn, or as menacing as a tiger  but here he has a role that allows him to be both tough and gentle in the same moments and he carries it off well... 'The 4400' works because of its excellent scripting and direction, but Coyote's thoughtful performance nails it down." Production on 13 episodes will begin in February in Vancouver in anticipation of a June launch. 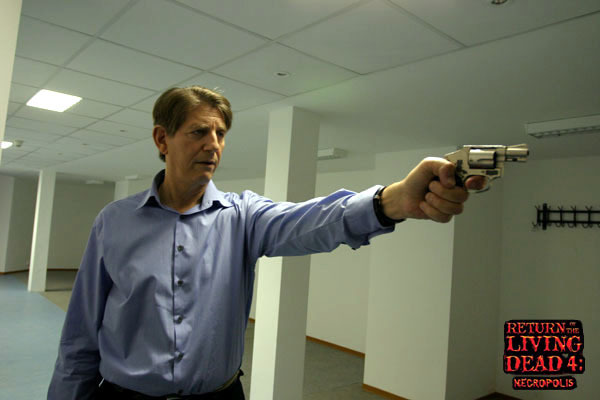 If you missed the six-episode "4400" series in July, don't fret! There's a DVD coming out with the complete first season on two discs, available on December 21st. You can pre-order it now at Amazon.com, as well as the new release of the insane Yiddish comedy, The Hebrew Hammer, which will become available on November 16th, but can also be pre-ordered now. 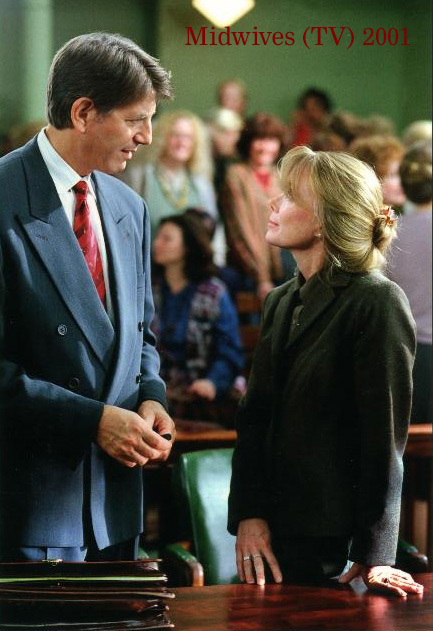 There's been quite a few DVD releases of Peter's films, new and old, in the past nine months - The People vs. Jean Harris (1981) with Ellen Burstyn and Martin Balsam, Femme Fatale (2002) with Antonio Banderas and Rebecca Romign-Stamos, Bon Voyage (2003) with Gerald Depardieu and Isabelle Adjani A Time for Dancing (2000) with Larisa Oleynik and Shiri Appleby, A Walk to Remember (2002) with Mandy Moore, A Man in Love (1987) with Greta Scacchi, Jagged Edge (1985) with Jeff Bridges and Glenn Close, Outrageous Fortune (1987) with Bette Midler and Shelley Long, Timerider (1982) with Fred Ward, and the Coyote-narrated 2004 edition of Unprecedented - The 2000 Presidential Election. Here are a couple publicity photos from Le Grand Role opening in France on Wednesday. 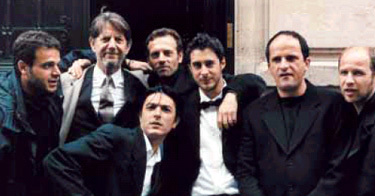 The first one shows the cast along with director Steve Suissa on the left, and the second photo is from a scene with Stephane Freiss. In the film's production notes, director Steve Suissa relates a memorable meeting with Peter. "In the film, the character of Grichenberg was inspired by Steven Spielberg. 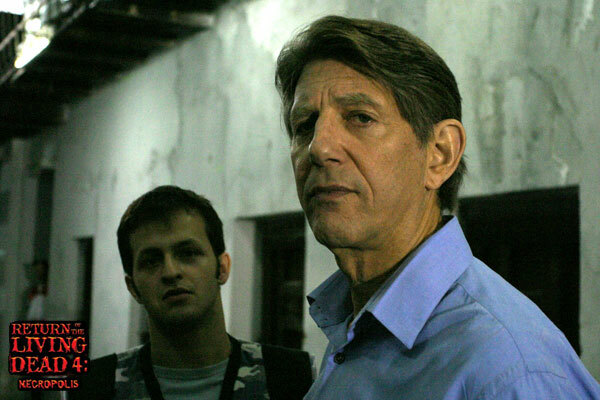 Wanting an American for this role, I forwarded the script to Peter Coyote, who indicated he was very interested. I set up an appointment to meet him at the Café de Flore because he adores Saint-Germain-des-Prés! Sophie Tepper accompanied me and when we arrived at the Flora, Spielberg himself was sitting at a table having coffee doing a promotion for Minority Report... 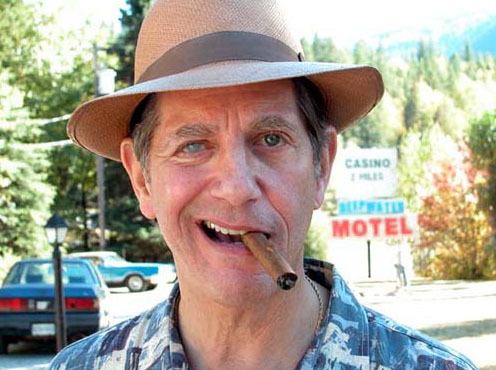 In an instant, I requested Peter Coyote to grow a beard to look like Spielberg. He was remarkable. He did everything to make himself available with the conditions of our modest production." Announcement: The Gershman Y in Philadelphia will celebrate its 80th Anniversary in 2004, kicking off this celebration with the Opening Night of the Jewish Film Festival on November 13th. Guests will enjoy the film Le Grand Role as well as a magnificent reception. In this French comedy an American film director goes to Paris to cast a Yiddish version of The Merchant of Venice. Mr. Coyote and His Excellency Jean-David Levitte, Ambassador of France to the United States, will speak following the film. Tickets to the 80th Anniversary Kick-Off Celebration are $80. The ticket price includes the film and reception. Call 215-446-3021. Proceeds benefit The Gershman Y.
Coyote's next film project will be A Little Trip to Heaven starring Forest Whittaker, Julia Stiles and Jeremy Renner. The $12 million production, which will be filmed in Iceland and Minnesota, is directed and written by Icelander Baltasar Kormákur. It's the story of an insurance investigator named Holt (Whittaker), who's sent to investigate an auto death where the victim was a known con-man and the sole beneficiary of his million-dollar policy was his sister, Isolde. Things appear suspicious, and Holt gets drawn into a complex ruse of shifted identities and falls for the sister, complicating matters. It's a perfect little "caper" movie, set in America, but using the bleak Icelandic landscape for part of its tonal statement. Peter plays Frank, Holt's partner in a sleazy insurance company that practices various deceptions to bilk their clients out of their rightful money. His character is described as having the "walk and talk of a silver-tongued car salesman." I don't believe Coyote has ever played a salesman before, but we all know he'll have fun with this role. As previously reported, Le Grand Role will be premiering in Paris in a couple weeks, and Peter will be in attendance opening night. He refers to it as a four-hanky film, done on a low budget by a very talented and passionate director. He's definitely looking forward to seeing the finished film and being back in Paris. Hopefully it proves to be a successful comedy. In an effort to revitalize San Francisco's film industry, Mayor Gavin Newsom has nominated Peter's wife, Stefanie, to head the film office. Her experience includes 15 years working as a location manager for such films as The Rock, The Game, Hurlyburly and Jade. Estimating that the industry generates $365 million annually for the city's economy, Newsom promised greater support for the local film industry. Stefanie noted that "the broad stroke is to clearly change the perception of San Francisco as being a difficult and unwelcoming place for film production." She said directors could be brought back with a combination of tax breaks, a streamlined permit process, and cheaper production space at Treasure Island. In an interview with The SF Examiner, she said she wanted the City's top film job because the industry "wasn't a high priority" during the last years of Mayor Willie Brown's tenure. She said her role would be that of a "facilitator." This past summer Peter was in Bucharest, Romania, filming back-to-back sequels for Return of the Living Dead. The fourth sequel called Necropolis features Coyote as shady science entrepreneur Charles Garrison, who uses a radioactive trioxin compound in covert experiments to turn the recently deceased into killing machines. The following sequel, Rave from the Grave, has Garrison's nephew finding two secreted barrels of the chemical, which he manufactures into an Ecstacy-type drug that turns humans into crazed ghouls. 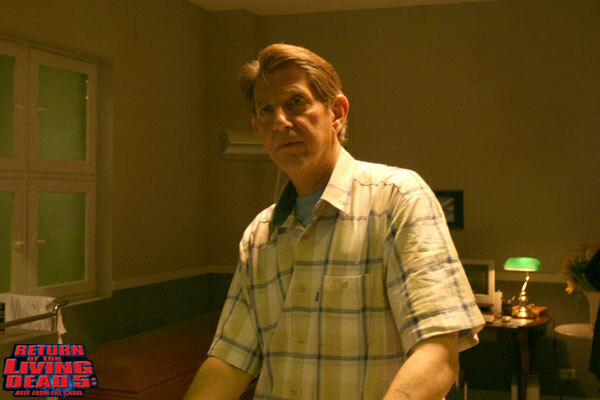 In the Necropolis opening, Garrison buys the radioactive material from a Russian mob in Chernobyl. Producer Anatoly Fradis managed to get permission to become the first American production ever to film inside all three Chernobyl exclusion zones. Fradis described the place as "very spooky shooting in abandoned towns and villages with rusting equipment lying around everywhere." Director Ellory Elkayem agrees, "I thought the Chernobyl idea was a great way to start a horror movie." The July shoot dates occurred during a hiatus from the main body of filming. The cast, which also includes Aimee-Lynn Chadwick, Cory Chadwick, Jana Kramer and John Keefe, received a well-deserved rest from their punishing nighttime schedule. Exactly a year ago, a five-week film production began in British Columbia's North Thompson Valley for an eerie psychological thriller called Deepwater. 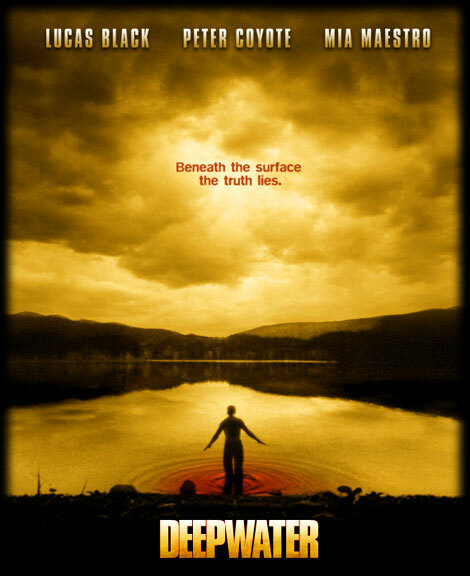 Based on the book by Matthew F. Jones, the story concerns a drifter named Nat Banyon who enters the strange town of Deepwater, and is drawn into a deadly game. Peter has the role of the enigmatic motel owner Herman Finch and says his character was great fun to play - "lots of gold and chains, a bad eye and a gold tooth." The cast also includes Lucas Black, Mia Maestro, Lesley Ann Warren and Michael Ironside. Coyote film buffs should be able to name two other movies in which Ms. Warren and Peter have starred in together. To download the Deepwater trailer and view a behind-the-scenes clip, visit the film's official web site. No release date has been given yet. 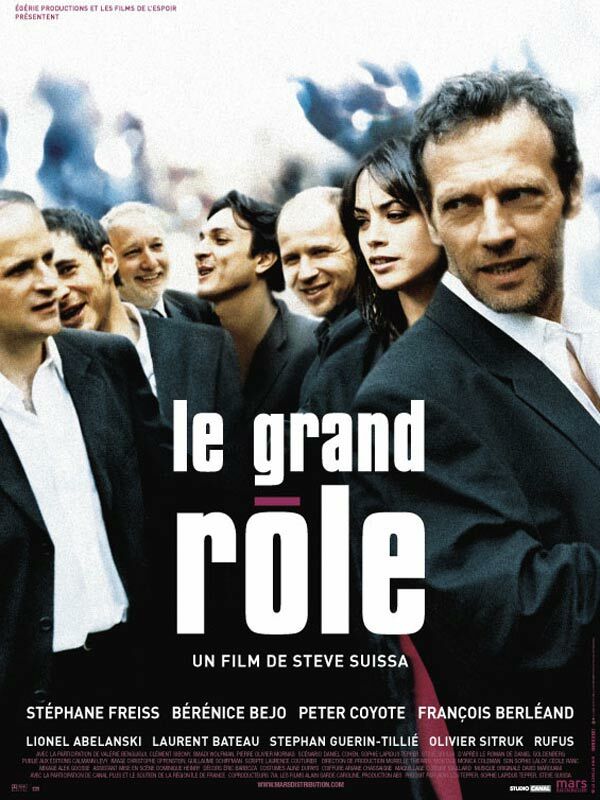 Last year Peter returned to France to do a film with director Steve Suissa called Le Grand Role. It played at various film festivals earlier this year and will now open in theatres in France and Belgium on October 13. Here are some excerpts from Variety's review: "Predictable yet charming, Le Grand Role is a crowd-pleasing dramatic comedy about love, friendship, role-playing and Jewish pride... So in love with his wife, Perla, that he photographs her when she's not looking just for the heck of it, struggling Parisian actor Maurice Kurtz earns a meager income dubbing foreign films with his pals. When news hits that A-list superstar American film director Grishenberg (played by Peter) is prepping a big-budget Yiddish-lingo movie version of Shakespeare's The Merchant of Venice, the boys gear up for the audition with unrestrained enthusiasm. To his astonishment, Maurice lands the coveted role of Shylock, only to lose it a few days later when Grishenberg is forced to give it to an American star. In the meantime, Perla has discovered she's dying of cancer. Balance of pic finds Maurice and his chums going to ever greater lengths to make Perla feel better by persuading her that in his new role, her hubby's the toast of the town. Though telegraphing its every move with unabashed cheerfulness, Grand Role benefits from a sprightly pace, sunny thesping (though camaraderie among the chums is occasionally forced) and fine comic timing... Coyote himself delivers the best line: After being kidnapped in his own limo, Grishenberg refuses to meet Perla and go along with the gag. 'I'm an American,' he says with brittle dignity. 'Americans don't lie.'" The Palace of Fine Arts in San Francisco will host an evening called "Sean Penn in Conversation with Peter Coyote" on September 10. The sold-out performance will consist of film clips, an interview, brief Q & A session with the audience, and the presentation of the 2004 John Steinbeck Award. Steinbeck believed that writing and art could connect people, and that understanding one another would inevitable lead to greater tolerance, social change and the elimination of injustice. Each year San Jose State University presents the John Steinbeck Award to an artist who seems to embody that spirit. This year that recipient is Sean Penn. Adding to the ever-growing list of documentaries narrated by Peter are two films produced by Habitat Media Film. The first is the award-winning PBS special "Empty Oceans, Empty Nets", which examines the full extent of the global fisheries crisis and the forces that continue to push many marine fish stocks toward commercial extinction. The program also documents some of the most promising and innovative work being done to restore fisheries and protect essential fish habitat. New market initiatives are examined that give consumers a powerful vote in deciding how our oceans are fished. Commentary is provided by fishermen and by many of the world's most respected marine and fisheries scientists. The documentary is 55 minutes, but is also available in a 15-minute version. The 54-minute sequel directed by Steve Cowan is called "Farming the Seas". With stunning visuals and compelling narration, this filmmakers journey around the world documenting the most important stories as they unfold: some resulting in a net loss of marine resources and environmental degradation while others are innovating practices that offer solutions to this looming crisis. From the indigenous tribes of British Columbia to the large-scale operations of multinational corporations, from Mediterranean fishermen to Thai shrimp farmers, perspectives are gathered from around the globe as it examines the problems and the promises of this emerging industry. PBS has just announced that they will release this documentary on November 18, 2004. For more information on these films, visit Habitatmedia.org.